Guest choreographer Daniel Martinez wants to challenge his audiences’ perception of what dance is with this year’s Fall Dance Concert. It’s something he’s discussed with his performers. “Maybe you don’t have to move in a certain way, maybe you can do awkward shapes with your body, stuff like that,” Martinez said. The Eastfield Dance Company will perform Dec. 6 and 7 at 7:30 p.m. in the Performance Hall. The concert consists of two acts and a total of 14 dances. Most dances will have a combination of choreographed pieces and improvisation. Dance Program Coordinator Danielle Georgiou will be instructing the dancers along with guest choreographers Martinez, Jasmine Morris and Colby Calhoun. In her first semester at Eastfield, dance major Sarah Mendez said she is enjoying the program. “It’s different, but different in a really, really good way,” Mendez said. Since the group is somewhat smaller than many school programs, she said that she has had more opportunities to contribute than at other institutions. Mendez has been dancing since she was 5 years old. As a dance major, she said she needs a place to start expanding her choreography. “I followed Danielle’s work on Instagram and I recently just became interested in [Eastfield’s] dance program last semester when I was at Richland,” she said. Mendez said she knew that students had chances to choreograph movements, be nurtured and gain skills necessary to succeed. Georgiou is a professional dancer and choreographer, dancing for 30-plus years, and running her own dance theater company for the last eight years. She has been working at Eastfield for seven years. 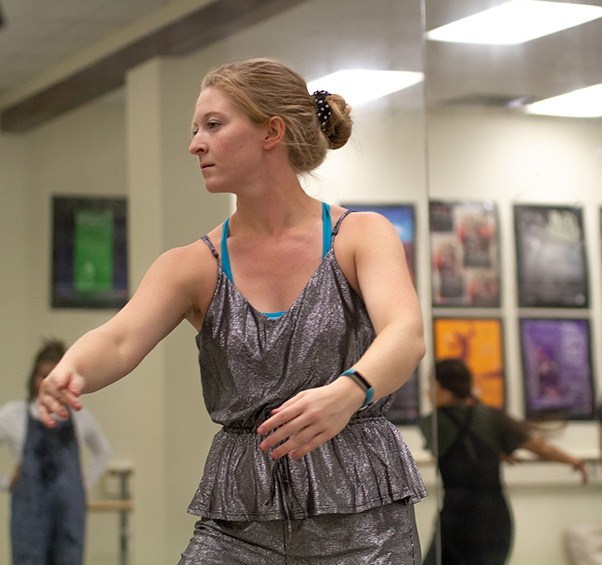 When she first started teaching at Eastfield, she said the school had only two courses in dance. Georgiou creates the department and the curriculum now, a pathway she said many students use to earn their associate degree in dance. Georgiou recently earned her doctorate from the University of Texas at Dallas. Her goal is to make an audience question if what they see is dance, or if it’s theater. She said she doesn’t make it easy by laying out what the performance is about or what it means. She wants the audience to feel like they are a part of it. Guest choreographer Martinez is also an adjunct professor of art at Eastfield. He said he originally found out who Georgiou was through the Dallas art scene when he was still in graduate school and decided to start taking her classes. After graduating and beginning to teach at the school last year, he asked her if he could do a sort of seminar. Mendez said she has learned a lot through these teachings. Mendez said it was like a dream come true that she was now learning to choreograph.